For other people with the same name, see Samuel Crawford (disambiguation). Samuel Earl "Sam" Crawford (April 18, 1880 – June 15, 1968), nicknamed "Wahoo Sam", was a Major League Baseball outfielder for the Cincinnati Reds and Detroit Tigers from 1899 to 1917. He was elected to the Baseball Hall of Fame in 1957. Crawford batted and threw left-handed, stood 6 ft 0 in (1.83 m) tall and weighed 190 pounds. He was one of the greatest sluggers of the dead-ball era and still holds the Major League records for triples in a career (309) and inside-the-park home runs in a season (12). He has the second best all-time record for most inside-the-park home runs in a career (51). He finished his career with 2,961 hits and a .309 batting average, and became the first player to lead both American League and the National League in home runs (1901 and 1908). Ed Barrow, who managed Crawford in his first two years with Detroit, and went on to convert Babe Ruth to an outfielder as general manager of the Yankees, once said that there never was a better hitter than Crawford. One of his contemporaries, Fielder Jones, said of Crawford: "None of them can hit quite as hard as Crawford. He stands up at the plate like a brick house and he hits all the pitchers, without playing favorites." Crawford was among the American League leaders in hits, RBI, extra base hits, slugging percentage and total bases for 11 consecutive years, from 1905 to 1915. Using the "Gray Ink Test", which awards points based on how often a player is among the league batting leaders, Crawford ranks as the ninth best hitter of all time, ahead of greats such as Ted Williams and Mickey Mantle, among others. Crawford was born in Wahoo, Nebraska, in 1880, the son of Stephen O. Crawford (born 1842 in Vermont) and Nellie Crawford (born 1855 in Iowa). In 1901, he married Ada M. Lattin, born circa 1881 in Nebraska. He was listed as a ballplayer in 1910, and had one daughter, Virginia, born circa 1905 in Michigan. Various ship records confirm his birthdate and that of wife Ada. As of the 1920 U.S. census, he was living in Los Angeles, with wife Ada and daughter Virginia, and a new addition: Samuel, born ~1918 in California (Samuel Earl Crawford, March 15, 1918 – October 18, 1996). According to a biography from the Nebraska Hall of Fame, Crawford was a star athlete at Wahoo High School, leading the team to two state football championships in 1896 and 1897 and was also noted for "foot racing" wherever he played. In 1898, he joined a traveling baseball team in Wahoo. They traveled on a lumber wagon from town to town for weeks at a time, challenging the locals to baseball games, and passing the hat to pay their expenses. Crawford was offered an opportunity in the spring of 1899 to play for the Chatham Reds of the Canadian League for $65 per month, plus board. Crawford seized the opportunity and left behind his job as a barber's apprentice. From Chatham, Crawford moved on to play for the Grand Rapids Prodigals in the Western League. In September 1899, Grand Rapids sold Crawford to the Cincinnati Reds. Crawford played in 31 games for the Reds at the end of the 1899 season. At age 19, and one year removed from his days playing for Wahoo's traveling team, Crawford was playing in the major leagues with future Hall of Famers Jake Beckley and Bid McPhee. Crawford hit .307 in 31 games with the Reds in 1899. In 1900, at age 20, Crawford played in 101 games and was among the National League leaders in triples with 15 and home runs with seven. Crawford proved to be one of the best sluggers in baseball in 1901, batting .330 and hitting a major league leading 16 home runs. Crawford was also third in the National League in triples (16), RBIs (104) and slugging percentage (.524). Crawford had another solid year in 1902, leading the National League in total bases (256) and triples (22), and placing second in batting average (.333), slugging percentage (.461) and extra base hits (43). Crawford hit 12 inside-the-park home runs in 1901 – a major league record that has never been equaled. 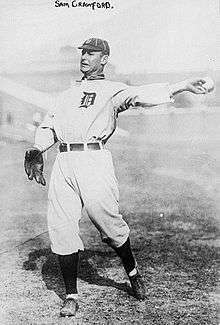 Sam Crawford was honored alongside the retired numbers of the Detroit Tigers in 2000. At the end of 1902, a bidding war for players developed between the National and American Leagues. Crawford signed contracts with both the Reds and the Detroit Tigers. The competing contracts led to a publicized legal dispute, with a judge ultimately awarding Crawford to the Tigers but requiring $3,000 in compensation to the Reds. Crawford joined the Tigers for the 1903 season and remained there until the end of his major league career in 1917. In 1903, he led the American League with 25 triples, and finished second in the batting race with a .335 batting average. With the addition of Ty Cobb at the end of the 1905 season, the Tigers had two of the best hitters in baseball. Cobb and Crawford led Detroit to three straight American League pennants in 1907, 1908 and 1909, but both of them slumped in their World Series appearances, as the Tigers lost all three World Series. Crawford hit for a .243 average in three World Series, and Cobb hit an uncharacteristic .200 in the 1907 World Series and .231 in the 1909 World Series. Although Crawford never got to play in another World Series, he remained one of the most feared hitters in baseball through 1915. In 1911, he hit a career-high .378 with 115 RBIs and 57 extra base hits. 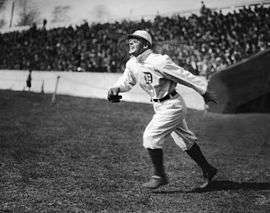 From 1913 to 1915, Crawford played in 472 consecutive games for the Tigers. Crawford was among the American League leaders in hits, RBIs, extra base hits, slugging percentage and total bases every year from 1905 to 1915. He led the American League in triples five times, including an American League record 26 triples in 1914. Crawford remains the all-time major league leader with 309 triples in his career. Though his fielding suffered in his later years, Crawford was an excellent fielder in his prime. In 1905, he led all American League outfielders with a .988 fielding percentage – 35 points higher than the league average. And in 1900, his range factor was 2.68 – 55 points higher than the league average of 2.13. In 1916, the Tigers began transitioning the right field responsibilities from Crawford to their young hitting star, Harry Heilmann. That year, Crawford played 78 games in right field, and Heilmann played 66. Despite leading the league in both RBIs (112) and extra base hits (54) in 1915, Crawford saw his plate appearances cut almost in half in 1916 (from 694 to 368) as the Tigers made room in the lineup for Heilmann. In 1917, Crawford lost his spot in the lineup altogether and was relegated principally to a pinch-hitting role. In his new limited role, Crawford hit .173 in 104 at bats. At the end of the 1917 season, Crawford was released and did not play again in Major League Baseball. Despite being discarded by the Tigers, Crawford was not ready to quit playing. He joined the Los Angeles Angels in the Pacific Coast League, helping them to win league championships in 1918 and 1921. Perhaps hoping to show the Tigers were wrong in casting him aside, Crawford exploded on the scene for the Angels, as he got two hits, stole a base and threw out two runners in his first game. Crawford played four seasons for the Angels (1918–1921). In 1919, he hit .360 with 239 hits, 41 doubles, 18 triples, 14 home runs and 14 stolen bases. He collected another 239 hits, 46 doubles and 21 triples in 1920, and even in 1921 managed 199 hits and 44 doubles. Crawford decided to stay in Southern California, and in 1924, he accepted a position as the head coach of the University of Southern California baseball team. Crawford was the USC baseball coach from 1924 to 1929 and was instrumental in the development of the California Intercollegiate Baseball Association in 1927. He led USC to second-place finishes in his last two seasons. Crawford was 59-46-3 as the USC coach and 55–33 against other college teams. Crawford later worked as an umpire in the Pacific Coast League from 1935 to 1938. Crawford found it to be a thankless job and a lonely life, and quit after four years. In 1927, Crawford had a role as the baseball coach in Buster Keaton's film comedy College. Sam Crawford and Ty Cobb were teammates for parts of 13 seasons. They played beside each other in right and center field, and Crawford followed Cobb in the batting order year after year. Despite the physical closeness, the two had a complicated relationship. Initially, they had a student-teacher relationship. Crawford was an established star when Cobb arrived, and Cobb eagerly sought his advice. In interviews with Al Stump, Cobb told of studying Crawford's base-stealing technique and of how Crawford would teach him about pursuing fly balls and throwing out base runners. Cobb told Stump he would always remember Crawford's kindness. The student-teacher relationship gradually changed to one of jealous rivals. Cobb was unpopular with his teammates, and as he became the biggest star in baseball, Crawford was unhappy with the preferential treatment given Cobb. Cobb was allowed to report late for spring training and given private quarters on the road – privileges not offered to Crawford. The competition between the two was intense. Crawford recalled that, if he went three for four on a day when Cobb went hitless, Cobb would turn red and sometimes walk out of the park with the game still on. When it was initially (and erroneously) reported that Nap Lajoie had won the batting title, Crawford was alleged to have been one of several Tigers who sent a telegram to Lajoie congratulating him on beating Cobb. In retirement, Cobb wrote a letter to a writer for The Sporting News accusing Crawford of not helping in the outfield and of intentionally fouling off balls when Cobb was stealing a base. Crawford learned about the letter in 1946 and accused Cobb of being a "cheapskate" who never helped his teammates. He said that Cobb had not been a very good fielder, "so he blamed me." Crawford denied intentionally trying to deprive Cobb of stolen bases, insisting that Cobb had "dreamed that up." When asked about the feud, Cobb attributed it to jealousy. He felt that Crawford was "a hell of a good player", but he was "second best" on the Tigers and "hated to be an also ran." Cobb biographer Richard Bak noted that the two "only barely tolerated each other" and agreed with Cobb that Crawford's attitude was driven by Cobb's having stolen Crawford's thunder. Although they may not have spoken to each other, Cobb and Crawford developed an uncanny ability to communicate nonverbally with looks and nods on the base paths. They became one of the most successful double steal pairings in baseball history. After Cobb died, a reporter found hundreds of letters in his home responding to letters Cobb had written to influential people, lobbying for Crawford's induction into the Hall of Fame. Crawford was reportedly unaware of Cobb's efforts until after Cobb had died. 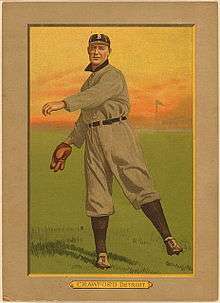 Crawford 1911 baseball card by the American Tobacco Company. Crawford was elected to the Baseball Hall of Fame by the Veterans Committee in 1957. At the time, he was living in a small cabin on the edge of the Mojave Desert near Pearblossom, California. Reporters showed up in Pearblossom with the news, shocking the locals, who were unaware that their neighbor had even played Major League Baseball. After his election, Crawford told the curator in Cooperstown that he wanted his plaque to read, "Wahoo Sam." He noted: "That's my hometown, and I’m proud of it." In retirement, Crawford became somewhat reclusive, staying away from official baseball functions. In March 1964, in Baywood Park, California, he was interviewed by Lawrence Ritter for his 1966 book The Glory of Their Times, a series of interviews with the players of the early 20th century. His tales of Tiger teammates such as Cobb, Cincinnati teammates such as deaf player William "Dummy" Hoy, and opponents such as Wagner helped to make the book one of the most admired ever written about baseball. Crawford spent much of his later years working in his garden and reading. During the Ritter interviews, he quoted from the works of philosopher George Santayana and abolitionist Robert Ingersoll, and discussed the works of one of his favorite writers, Honoré de Balzac. As for how he hoped to be remembered, he said: "When I kick off they’ll say, ‘Well, good old Sam, he wasn’t such a bad guy after all. Everything considered, he was pretty fair and square. We’ll miss him.’"
Crawford suffered a stroke on May 26, 1968, and died two weeks later at Hollywood Community Hospital in Los Angeles at age 88. He was interred in the Inglewood Park Cemetery in Inglewood. In 1999, he ranked Number 84 on The Sporting News' list of the 100 Greatest Baseball Players, and was nominated as a finalist for the Major League Baseball All-Century Team. ↑ "THE OBIT FOR SAM CRAWFORD". TheDeadBallEra.com. ↑ "Player Pages>Sam Crawford". TheBaseballPage.com. ↑ "Sam Crawford Entry". Baseball-Reference.com. ↑ "Gray Ink Test Leaders All-Time Batting". Baseball-Reference.com. ↑ Twelfth Census of the United States, United States Census, 1900; Stocking, Saunders, Nebraska; roll T623 939, page 18B, line 98. Retrieved on 2009-08-27. ↑ "Nebraska Sports High School Hall of Fame". ↑ Bauer, Carlos (July 29, 2004). "PCL MEMORABLE SEASONS- 1918". MinorLeagueBaseball.com. ↑ "The Sam Crawford Years (1924–29)". USC Trojans. Wikimedia Commons has media related to Sam Crawford.